"Scrooge." "Grinch." The very words are wrinkly, shriveled, hard-edged – like the fictional characters they name. Grinch. Scrooge. The words and the characters are lonely, disconnected from community and nature, wrapped up in their forlorn pursuits of security and undisturbed quiet. They stand, or imagine they do, alone – alienated from the very Earth on which they stand. I’m also thinking about what happens to Scrooge and Grinch. They who were asleep to the free treasures around them have an awakening experience. They wake up to a spirit of generosity. Scrooge has awakened indeed, and he is swept up in a crazy, joyous energy. So I think about Scrooge and Grinch. And I remember that for most of the history of Christmas, there weren’t gifts. Gift-giving was not a part of Christmas. When some of the early Puritans in New England began exchanging a small token of regard, the church authorities scowled and discouraged it. The spirit of generosity may sleep for a millennium or two, but it must awaken eventually. Maybe there’s something about this winter season of long and cold nights that pulls at us with a tug that can be resisted for a long time but not forever – calls to us to respond with generosity of heart. Or maybe it’s the story we keep re-telling about that prophet’s birth, about love being made flesh and dwelling among us. Maybe that’s what finally directs us into practices of giving. For Scrooge and the Grinch, a dramatic awakening happens and it manifests in giving. The rest of us learn as best we can from their experience and from such examples, in life or in story, as we encounter. The 1988 movie, Scrooged, puts the Scrooge story in a modern setting. Bill Murray plays Frank Cross (another wonderfully hard-edged-sounding name, less wrinkly but sharper), the mean, lonely, self-absorbed president of a TV network. In the course of the film, Cross is brought to an awakening, and, here again we see the manic ebullience that bursts forth when a heart that’s been long encrusted first breaks open. Cross walks onto the set where a live production of "A Christmas Carol" is being broadcast, and gives a wild, impassioned speech to the cast, crew, and everyone watching on TV. Have you ever felt an imperative of giving of such clarity and ecstasy? You might have. Christmas can happen every day – a life of generosity and giving can be a part of all our days and years. But that kind of crazy energy must necessarily level out. That manic peak can’t be maintained. It’s not that the joy or the generosity has to go away or fade, just that it takes on a quality of abiding peace. For Scrooge, Dickens says, for the rest of his life “it was always said of him that he knew how to keep Christmas well, if any many alive possessed the knowledge.” He always ever-after had the spirit of giving, but, if the fictional character is to be true to life, Scrooge must have settled into a calm lovingkindness in contrast to his fluttery and giddy first day (or first week or first several monthes) after the ghosts visited. The Bill Murray character in Scrooged must eventually chill out a bit. It’s like first love. When we first fall in romantic love the blood is fired with hormones and endorphins and adrenaline, and we can’t think of anything but the beloved, can’t sleep, can’t concentrate. That passion feels great. It doesn’t last, and that’s a good thing because even greater is the sustained and sustaining ongoing and slow ever-deepening love that exists between a couple, long married, simply enjoying together the morning newspaper and cups of coffee. Are you at one of those ecstatic peaks? Have you been there and have moved through it? Have you settled down into a constant and abiding, peaceful and calm Christmas spirit that just rolls like a river: coursing unspectacularly through your life, and through you to those around you? Or are you waiting, not sure whether to believe in what might happen? Wherever you might be, you don’t have to sit around waiting for ghosts to show up in the night. Just give. Maybe you don’t fully comprehend what that’s about – you don’t have to. If waking up doesn’t come to you as a sudden startling grace, then let it come gradually. Just give. If you’re not convinced of the miraculous power of generosity, that’s OK. Fake it. Fake it ‘till you make it. Just give, and the miracle happens. Scrooge had an ecstatic transformation. For him, it followed from visions of ghosts in the night. For others, it might accompany singing angels, or a clear star illuminating the interconnection and holiness of all things. As wonderful and transformative as such experiences can be, what really matters is coming down from that mountain peak to engage in the year-round daily "work of Christmas." It takes sustained equanimity and abiding compassion for the long haul to do that work, day after day with enduring love: finding those lost, healing those broken, feeding those hungry. An episode of hysterical joy at the aching beauty of each moment sometimes -- not always -- permanently changes a person. 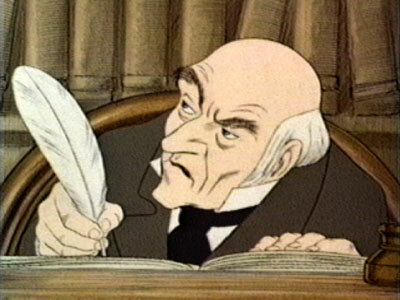 Scrooge, Dickens tells us, was among those for whom such an episode did effect a permanent change. He settled, it seems, into an abiding joy in a life of doing "the work of Christmas." Not all who have had such episodes get there -- and some people get there without any sudden profound awakening. Some people awaken very gradually and find one day that, although they cannot say when it happened exactly, peace, wisdom, and compassion shifted from "occasional visitor" to "frequent visitor" to "resident" qualities of experience, action, being. Such qualities increasingly visit and finally move in with hosts who simply do "the work of Christmas" day in and day out, as best they can, over the course of many years. The slow awakenings don't make for as riveting a story as the sudden transformations of Scrooge and Grinch, but the beauty and grace of the reshaped lives is as complete. Repealing "Don't Ask Don't Tell"